Released just months before the student uprising in Paris in May 1967, Jean-Luc Goddard’s confronting La Chinoise was not just a prophecy but perhaps even a provocation – a call to action from one of France’s most influential ‘New Wave’ filmmakers. Precisely capturing the spirit of the times, Goddard created a radical film about five university students sharing a comfortable apartment which, over the course of one summer, they transform into a hotbed of political theory. 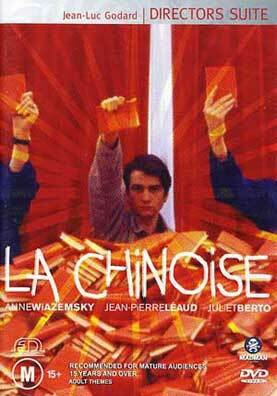 Veronique (Anne Wiazemsky – who became Goddard’s wife during the shoot) is 19 years old and deeply immersed in Mao’s ‘Little Red Book’, copies of which accumulate at an alarming rate as the film progresses. Her boyfriend, Guillame (Jean-Pierre Leaud) is equally attracted to the communist manifesto and quotes freely from it on a daily basis. A naïve peasant girl, Yvonne (Juliet Berto) is in on the act too; initially happy to clean the red lampshades and polish shoes, she is soon shouting anti establishment slogans at full throttle. Only Henri, the scientist (Michael Semeniako) is sceptical about the direction the group is taking; he and Francis Jeansson, the famous French academic who makes an impressive appearance discussing Veronique’s plan to address what she sees as the suffocating cultural climate through terrorism. Goddard begins his film with a shot of graffiti on the apartment wall which reads; ‘one must replace vague ideas with clear images’. And he does this by neatly dividing his film into three movements interspersed with random musical outbursts and shots of the crew in action, right down to the clapper board marking scenes. The effect is one of discombobulation which, in a way, mirrors the student’s exploration of current political theory. What we have in the end is a lesson not only in politics but also in cinema itself and James Hewison, the Executive Director of the Melbourne International Film Festival deepens the experience with his insightful audio commentary. As he says, it’s hard to imagine contemporary cinema without this film. It may be a hard slog but it has many rewards.